Play is a staple of childhood. It is also the time when children, especially young children, gain important life skills, including leadership, problem solving and communication. 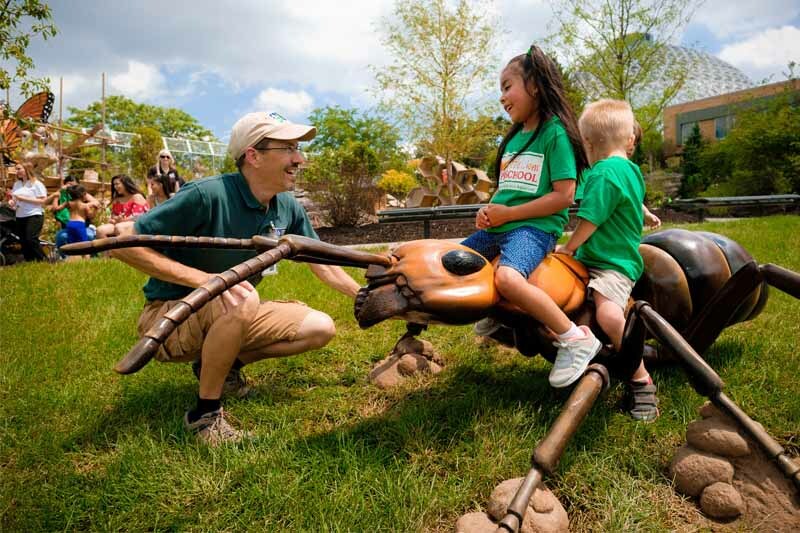 In the summer of 2017, Omaha’s Henry Doorly Zoo and Aquarium opened a new exhibit, The Bay Family Children’s Adventure Trails (Children’s Adventure Trails), based on the simple principle that play and exploration can serve as an important tool for parents and children. Described as an “interactive exhibit that highlights kids’ learning through play in nature,” the exhibit makes effective use of its five-acre space with everything from a three-story tree house, where children can run alongside small primates who are also playing in elevated display areas, to an interactive watershed featuring four bridges, fallen log crossings and moveable platforms. However, Children’s Adventure Trails is not just a benefit for children. It has also become an important source of data, and collaboration, for education experts at the University of Nebraska at Omaha (UNO). Prior to the opening of the exhibit, assistant professors Amanda Steiner, Ed.D., and Anne Karabon, Ph.D., both from UNO’s Department of Teacher Education, partnered with the Zoo to plan a research project that would examine the impact of the exhibit and provide feedback on how to make improvements. A year later, their research has provided important insights into the relationships between play and learning, as well as the relationships between UNO and its community partners. Learn more about degree options within UNO's College of Education. 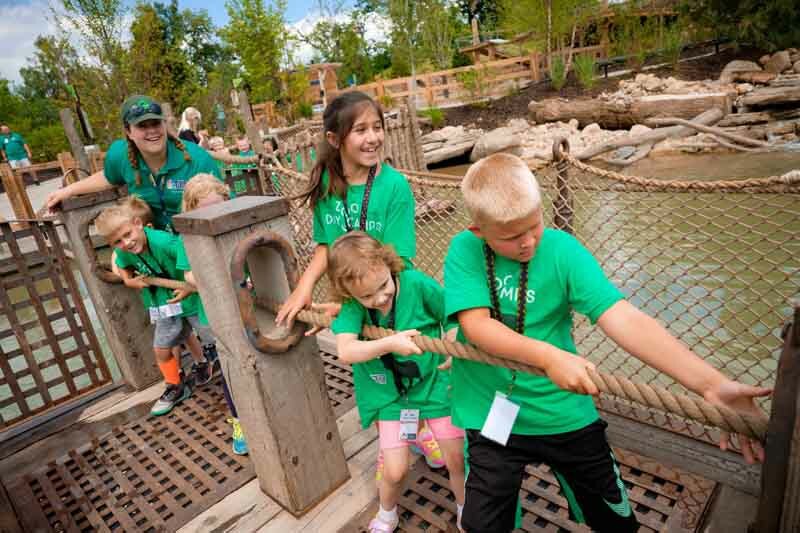 Elizabeth Mulkerrin, Ed.D., a UNO alumna and vice president of education for Omaha’s Henry Doorly Zoo and Aquarium, explains that Children’s Adventure Trails was designed to support the development of children regardless of how old they are. 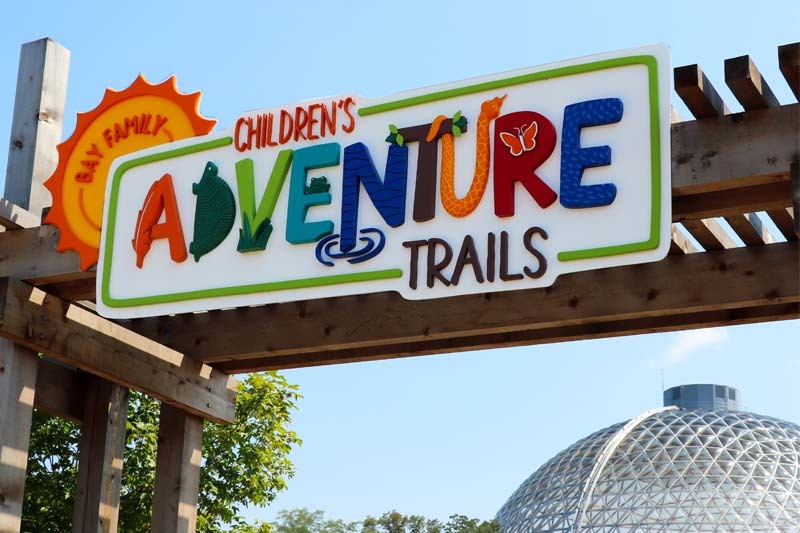 The Bay Family Children's Adventure Trails opened at Omaha's Henry Doorly Zoo and Aquarium in July 2017. The exhibit s made up of a variety of habitats, interactive animal exhibits and climbing areas allowing guests to learn through exploring. Once the exhibit was open, Steiner and Karabon set to work collecting 64 hours of observational data and interviews through qualitative research methods with visitors and staff members. Throughout the summer, they set to work to identify areas of cognitive, physical, social and emotional development fostered by the space. Steiner and Karabon’s final report was provided to the Zoo at the end of 2017, but both Karabon and Steiner plan to utilize their data to draft their own research and analysis that they will take to conferences and publish in academic journals in the near future. One of the most significant findings from Steiner and Karabon’s time at Children’s Adventure Trails was the importance of facilitation and participation by adults, including Omaha’s Henry Doorly Zoo and Aquarium Play Facilitators and visitors. Karabon explains that what truly helps a child retain important information through play is the willingness for someone else to make the connections between their actions and important concepts areas like biology, chemistry, physics and math. Because caregivers are sometimes apprehensive about joining in the same types of play as their children, the exhibit also features trained Play Facilitators. Because of Steiner and Karabon’s report, the Zoo has ensured that their staff is well equipped to fill the need of facilitation as well as educating caregivers how to be facilitators themselves. "It’s important to identify that when children are playing in community institutions they are learning about themselves and the world." One of the biggest lessons for caregivers? Steiner says it is learning to give up control. 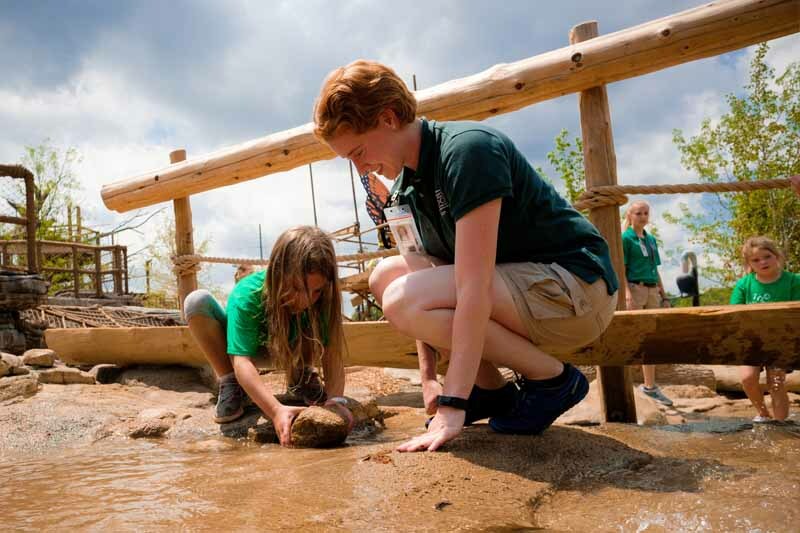 The work being done by Steiner and Karabon is just the most recent example of UNO’s longstanding commitment to community organizations like Omaha’s Henry Doorly Zoo and Aquarium. Not only has UNO partnered with the Zoo as a member of the Omaha STEM Ecosystem, which is designed to improve STEM education opportunities throughout Omaha, but dozens of teacher candidates have gotten practical experience through the Zoo’s Education Department, led by Mulkerrin. Not only are there educational opportunities, but service opportunities and research opportunities as well, including the College of Information Science and Technology working with local middle and high schools to create educational mobile apps for the Zoo and members of the USSTRATCOM Leadership Fellows learning from the Zoo’s leadership team. “I think it’s vital for our teacher education students to see the value of going into spaces, like the Zoo, to see what learning through play looks like” Karabon explains. “It’s important to identify that when children are playing in community institutions they are learning about themselves and the world. It’s a good reminder for all stakeholders that learning, in addition to formal institutions such as schools, occurs everywhere in children’s lives in." The partnership is also something that both Karabon and Steiner hope to continue well beyond this initial report. “We want to continue to engage in research and investigate if caregivers can recognize the value of play as children engage in this space, especially after they have had more opportunities to become familiar with the space,” Steiner says. Even more so, the impact of the partnership and research relationship between UNO and the Zoo can have a significant impact on the future of education in the state of Nebraska and across the country at large.